Raleigh, N.C., hosted a conference for the Society of American Travel Writers (SATW), April 24-27, at the Raleigh Marriott City Center with tours and functions throughout the destination. About 100 attendees, mostly travel writers based all over the world, were treated to an authentic Raleigh experience, exploring restaurants, attractions, shopping and more. Mandolin, opened in 2012 by Raleigh native and former Fearrington House chef Sean Fowler, is a Southern-at-its-core restaurant located near Raleigh&apos;s Five Points neighborhood. A menu that focuses on seasonality, sustainability and buying local is as likely to feature a lamb ragu or N.C. catfish as it is chicken and waffles. 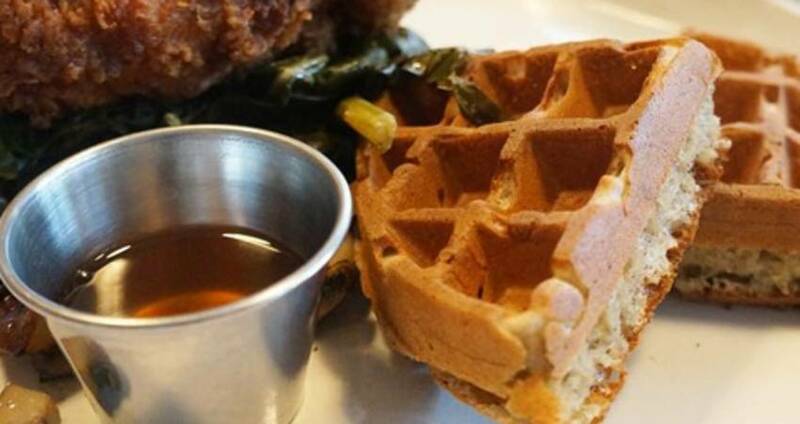 Carrie McLaren, a freelance travel writer based out of Jacksonville, Fla., in town for SATW, seized the opportunity to try those chicken and waffles and came away impressed. Carrie shared a photo on Instagram, and it&apos;s easy to see why this dish is our #visitRaleigh photo of the week. Tag your photos with #visitRaleigh on Instagram, Twitter and Facebook for a chance to be featured on our accounts!